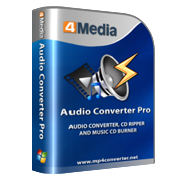 4Media Audio Converter Pro encompasses the functions of audio converter, audio extractor, CD Converter and CD burner, allowing you to convert between audio formats, extract audio from general and high-definition video files, convert CDs to music files, and burn CD from audio files. Joining audio converter, audio extractor, CD converter and CD burner together, 4Media Audio Converter Pro may be the most comprehensive audio conversion solution right for music fans like you, with which you can convert between all popular audio formats (MP3, WMA, WAV, AAC, FLAC, OGG, APE), extract audio from video files in nearly all HD and SD formats, convert CDs to music files and burn music CD from different format audio files. By applying audio effects (fade-in, fade-out, volume normalize, band pass, chorus, flanger, echo, speed), you can convert video/audio files or convert CDs to music files with particular effects you favor. 4Media Audio Converter Pro enables you to convert one audio track to multiple files in one go, clip audio segments you love, split audio files, and make more customizations with your outputted audio files. Expert-level audio converter available for you! Giving you high-speed audio conversion, CD converting and CD burning enjoyment, 4Media Audio Converter Pro is worth your trial! 4Media Audio Converter Pro supports decoding and encoding of all popular audio formats such as MP3, WMA, WAV, AAC, FLAC, OGG, APE. Besides audio decoding, this audio converter also allows decoding popular HD/SD video formats including AVI, MPEG, WMV, MP4, FLV, MKV, H.264/MPEG-4 AVC, AVCHD and converting them into audio formats. Convert CDs to music files compatible with different music players for playback anywhere you go. 4Media Audio Converter Pro enables you to create music CD from your favorite songs, making them playable on CD players. Ability to transfer CDs/videos/audio to your iPod, iPhone and PSP after converting or conversion. Multi-core CPU processing, multi-threading and batch process are supported, making the conversion, convertingand burning incredibly fast and easy. 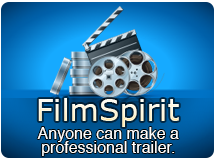 Available with different audio effects (incl. With multiple output formats set for one original file, you can get the same file with different formats in one click. 4Media Audio Converter Pro allows you to clip audio segments and convert them respectively to formats you want. Preset a split mode to specify the program split your audio tracks automatically during converting, convertingand burning. Make changes to any parameters to customize the outputted audio files; edit ID3 tag info of your audio tracks. 4Media Audio Converter Pro is available in English, German, Spanish, French, Japanese and Chinese.